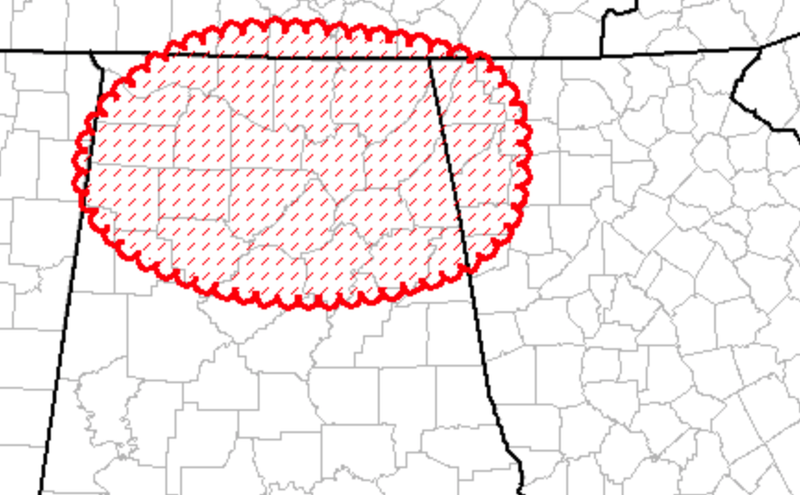 There is now a serious tornado risk in the area hatched below. 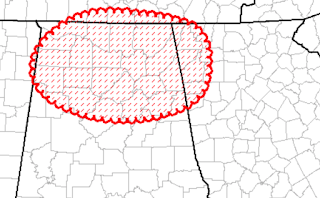 This area now has a 15% chance of violent tornadoes beginning on the west side of the area during the late afternoon and ending on the east side of the area tonight. This includes Huntsville and Birmingham. Make sure your shelter is ready to go. Have a flashlight already in your shelter area. Bring an infirm friend or neighbor to your home by 2pm or so if they would have trouble getting to shelter on their own. Put heirlooms in the shelter area now. If a warning is issued, take your cell phone and wear sturdy shoes in case you are to walk out through debris. Have at least two ways (TV and the AccuWeather app, for example) of getting the warning. This is a situation for preparation but not for worry! Just keep up on the weather this afternoon and into tonight.